I ordered the mini a few weeks ago. Since it is a new product, I wasn’t surprised to find out it was backordered. After waiting just a few days, I got the shipment notification. But then I watched and waited, and waited, and waited. After a week with no update on it, I sent a note to the company. The bad news is that it was marked as shipped and never left the facility. The good news is that they offered a discount and free shipping on a new order. Good enough for me. 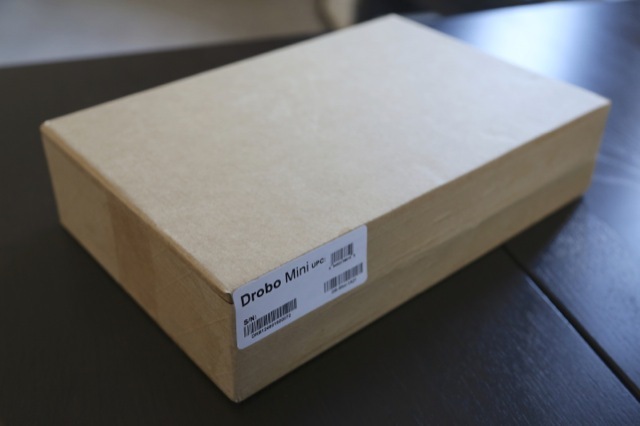 But, I’ve never been impressed with the ordering process straight from Drobo’s online store. When you make an order, you get a phone call later in the day confirming that you made the order. I know it’s to combat fraud, but I don’t love it. Also, shipping costs $20 at a minimum, or $100+ if you need it overnight. I suppose Amazon Prime has just spoiled us all. Then the retail box has a Macbook feel to it. In the image above, you’ll see Quick Start card. It’s real nice and simple. 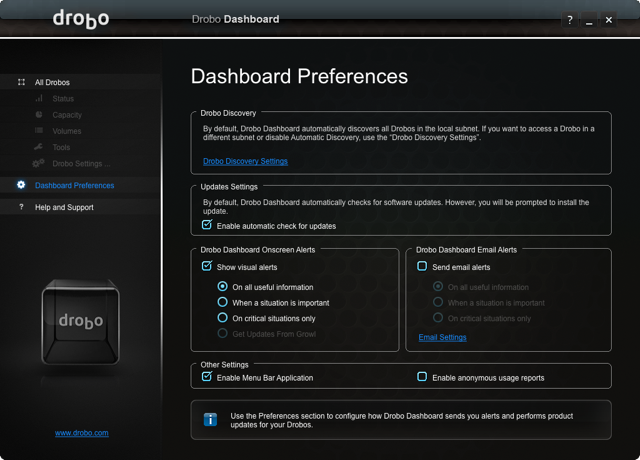 Basically, go to Drobo.com/start to download the Drobo Dashboard. 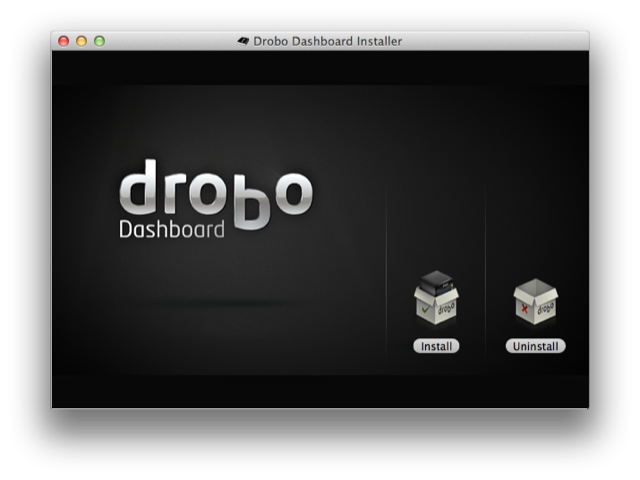 Then put in your hard drives, power up the drobo, and format the drives. Pretty quick. 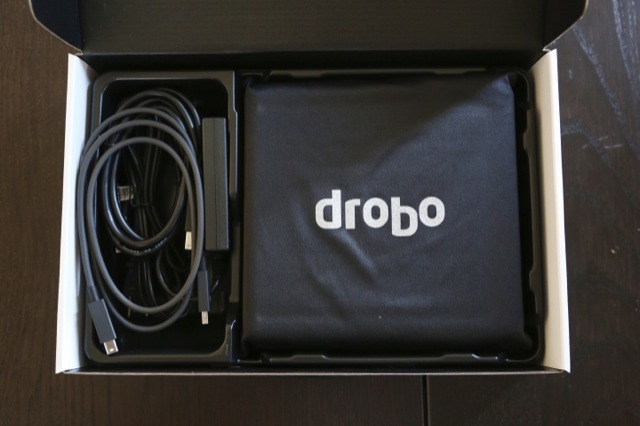 Inside the box you have the Drobo mini, a Thunderbolt cable, a USB3 cable, and the power cable and adapter. Of course, there is a port on back for each of those cables. You pull off the front plate. 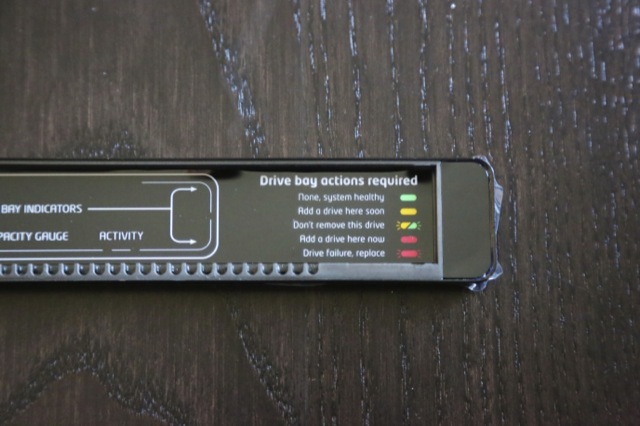 (It’s held on by strong magnets) and you’ll see the code for failing drives. 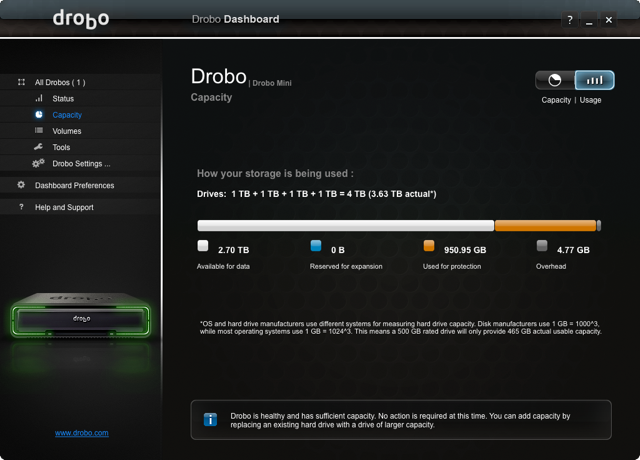 I decided to put in 1TB 5400RPM drives into the Drobo mini. 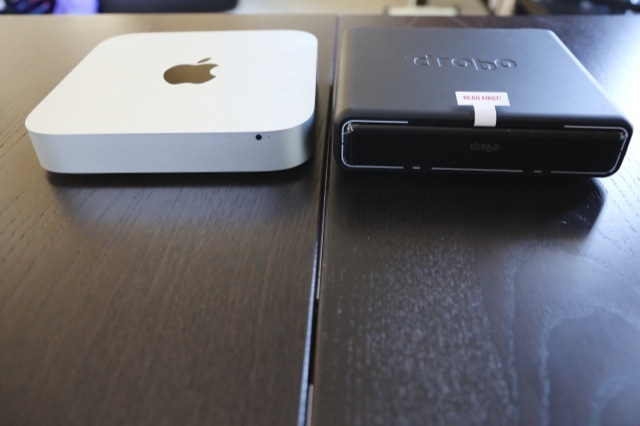 I imagine this will be a common install as people order a Mac mini server, put a couple SSD drives into the Mac mini itself, they can use the two removed 1TB drives into the Drobo mini and still have that space for storage and use. Speaking of the Mac mini, here are some comparison charts. They are actually quite similar in size, which I wasn’t expecting. 1) Sorry, it’s a handheld iPhone video. I did try to stabalize after though. 2) The power cord slides in, and then twists to lock. I didn’t quite catch it the first time. Learn from others mistakes. 3) The light up process is cool, I put it in 4x speed so we could watch the lights as they do their thing. Once the mini is formatted, started up, etc, it’s just a simple green light around the edge so it’s not distracting. 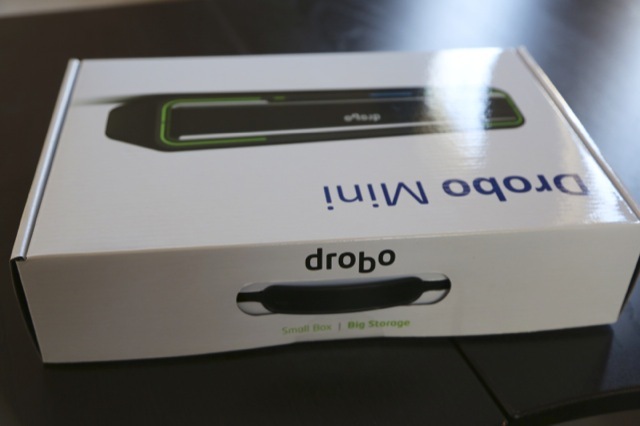 A look at the Drobo mini from Brian Stucki on Vimeo. Package installation that requires a reboot. Boo. Some good options in the app including how many light alerts you’re interested in, an email alert of issues, and whether you want the menubar icon. And just a couple things on available space. The diagram shows which drives are good. And, with four 1TB drives, you have 2.7TB of space to use. As far as performance, I just did a few things to get a feel for it. First, I grabbed the biggest single file on my Mac which is a video of the 1990 UNLV Basketball championship game. That file is 5GB. First I copied it from my internal HDD to my internal SSD on my iMac. That took 40 seconds. 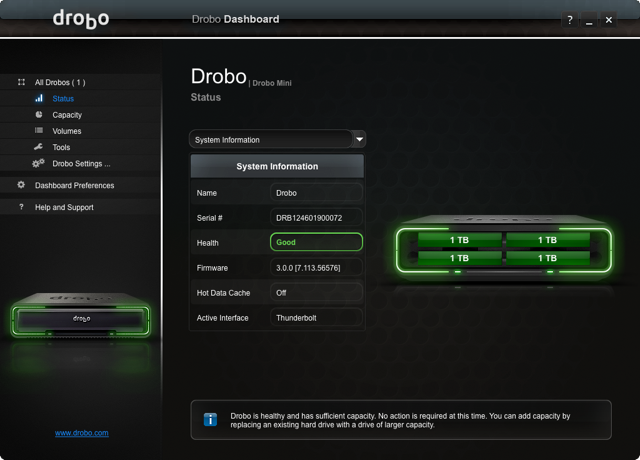 Then, I went from my internal SSD to the Drobo, and that took 15 seconds. Very fast. But, pushing it over Thunderbolt certainly helps. 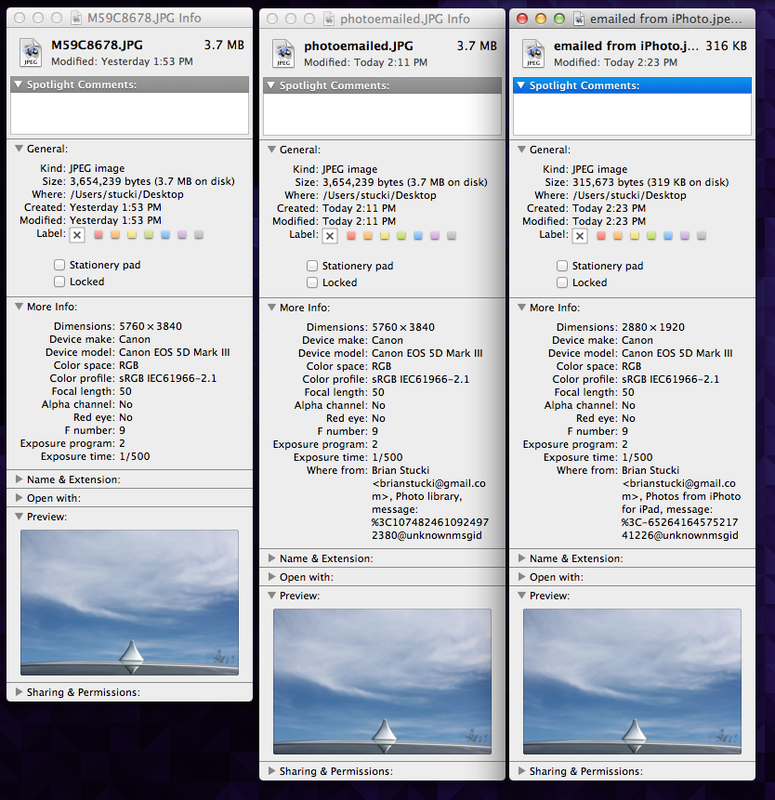 For a bigger test, I moved my full Aperture library. This is the worst kind of copy for data because it’s a large folder (114GB) full of 12,000 small files. To transfer this took 25 minutes. 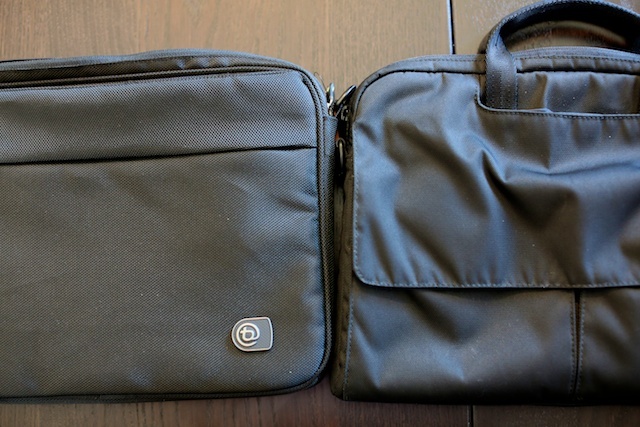 Once I had it there, I changed the library in Aperture and used it from teh Thunderbolt drive. It was noticeably faster than using the internal HDD drive. Importing, searching, and adjusting were very fast. 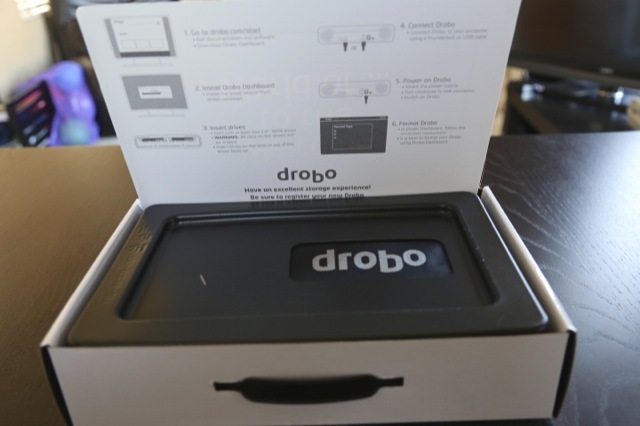 As for sound, it’s much improved than the full size Drobos that I had used in the past. While sitting on my desk, the iMac was louder than the Drobo. One can hardly hear either of them. Overall, the hardware feels high quality. And it better be because these drives are not inexpensive. 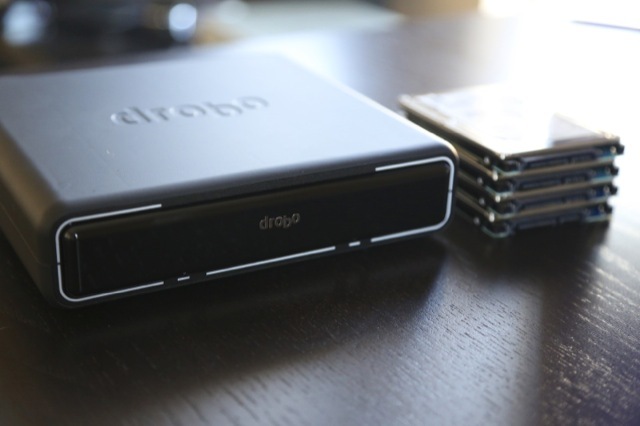 The Drobo mini is $649 without any hard drives. It is $1,249 if you order the option with 3TB of space. Both are available from the Drobo Store or if you want to save on shipping, it’s now in stock at Amazon. So what am I going to do with it? Personally, I’ll likely keep this drive to use as my Aperture library. I like the speed and the idea of keeping my photos on a RAID drive. For Macminicolo, we’ll likely make this an option to host along with your Mac minis. Since it’s about the size of a Mac mini, it’ll fit nicely in our shelving. 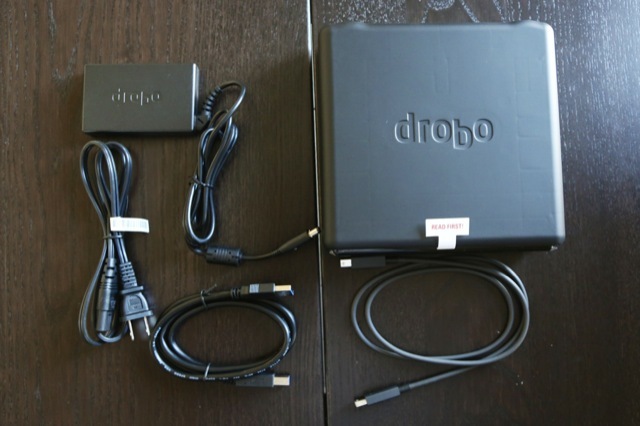 For others, the advice remains the same as with all Drobo products. The hardware looks good, the software protects well, but the price is high. For many geeks, it’s not a good equation since you can maintain backups well. But if someone just wants a good product, and few worries or maintenance, it’s a good option. It’s a calming interaction when a hard drive fails, you know you just need to pull it out and put in a new one. Sometimes peace of mind is worth it. Happy to answer any questions on twitter @macminicolo. 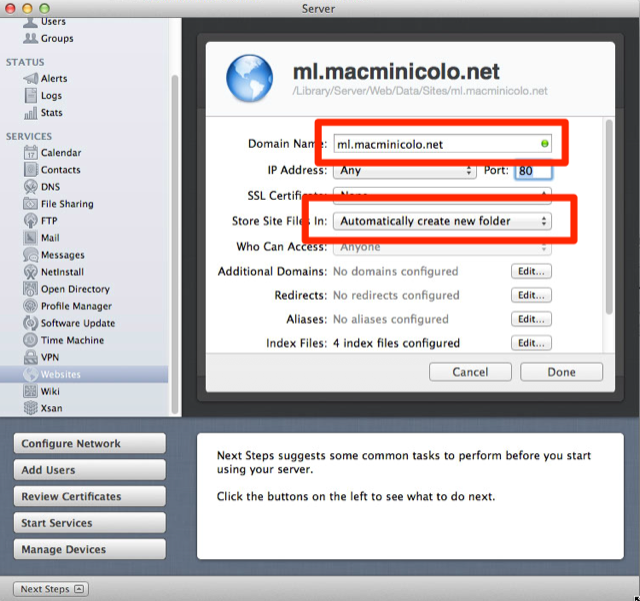 Macminicolo.net, a Las Vegas colocation company, has been hosting Mac minis since their introduction in January 2005. Low cost. High performance. They are the leaders in this niche market and are known for their personal service. They currently host hundreds of Mac minis for satisfied customers located in 31 different countries around the world. Get more info on our frequently asked questions page. Apple introduced a new Mac mini today. For the first time in a few years, the mac mini actually had some stage time as well. (Usually, it's just updated on the web site.) The update looks great, and of course we have them listed at Macminicolo already. Below are a few impressions of the new Mac mini. I'll add to this list and will also provide some benchmarks and as they start to arrive. To keep informed on updates, be sure to follow @macminicolo. Don't look now, but the new Mac minis are getting comparable to the last gen Xserve and 2010 Mac Pros as far as benchmarks. Tech progress marches on. All Mac minis now come standard with 4GB of RAM. Thank goodness. As of last week, the base Mac mini had 2GB of RAM and that was brutal with Mountain Lion. The Mac mini can officially be upgraded to 16GB now. It's been possible for over a year, but it had to be done after ordering. Now, Apple offers the 16GB of RAM. The base mini is still i5, but the middle and high end minis are quad core i7 Ivy Bridge processors. That middle mini is the most interesting. Many customers prefer the quad core for things like an Xcode build server or for plenty of cores to spread between virtual machines. That $799 Mac mini is going to be very popular. The machines now come with 1600MHz DDR3 Memory. Seriously, 16GB of 1600MHz RAM in such a small machine. It's really quite amazing. The Fusion Drive is only available for the middle ($799) Mac mini. Again, going to be very popular. It's a $250 upgrade for the Fusion Drive. Speaking of drive speeds, too bad to see that the Server now comes with 5400 RPM drives. (This is partly due to the change from 2x500GB to 2x1000GB). This will actually do for many people, but if you have a very active database server, definitely look at the SSD upgrades. As I look at all the options on the machines, one things sticks out. They've decreased the number of components to build the minis. For instance, all machines come with 4GB now, so Apple no longer has to stock 1GB modules and 2GB modules. The middle and upper tier minis both have the same 5400RPM 1TB drives. Standardizing supply decreases inventory and decreases component pricing. In marketing the Mac mini server, Apple writes "And you get amazing hardware and software, with support for iOS devices like iPad and iPhone, right out of the box." People understimate this selling point. I've confirmed over and over that Mac minis are a big selling point for bringing a small business or school to iPads and iPhones. It's the perfect iOS management server, and that's important for SMB and education. 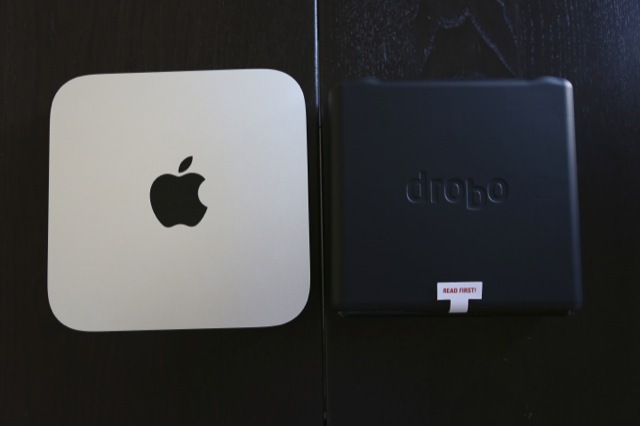 This is the third part of a series on installing Owncloud on a Mac mini. The first part is the actual installation process and the second part was integrating Owncloud with Open Directory on a Mac . This final part is for fine tuning PHP for Owncloud. Once again, thanks to @kolbyallen for his help. 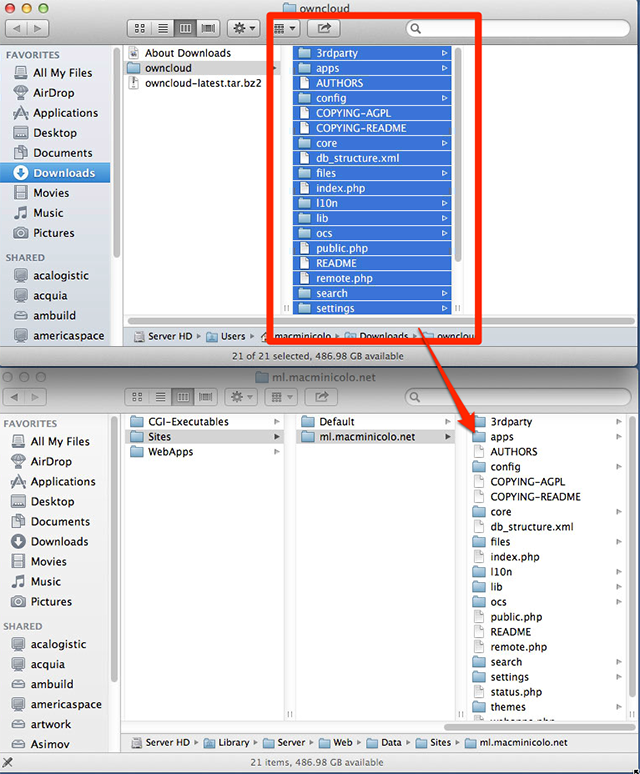 Since Owncloud uses PHP to handle all the files uploads the possibility of running into a file size issues increases. There are two types of PHP tuning that will be visited. First will be for a multisite host, the second is more for a server dedicated to serving Owncloud files. This assumes you have completed at least part 1 of this tutorial. These lines override the php.ini settings. Allowing only this app to have these values and not all sites on the system. 2) Before we start to change any of these values we need to make sure that the machine has enough RAM in the machine. If you have a machine with only 2 GB of RAM, then setting these values anywhere near or above that will cause issues. Lets break down each so that you know what settings you are changing. 3) upload_max_filesize: This controls the size of the files that can be uploaded from the web interface. So at its current setting, we can upload a 513MB file from the web interface. post_max_size: This value must always be the same or larger then the upload_max_filesize. This value controls how much data that php can post to the web server. 4) If you’d like to be able to handle files of 1 GB, then you would replace these values with 1G, but you would need at least 1GB of RAM available to the web server. So be careful when setting this. In my experience I always set these a little lower and then slowly creep them up to where the issues go away. To check if these need to be larger you can look in the error logs for php file size errors. 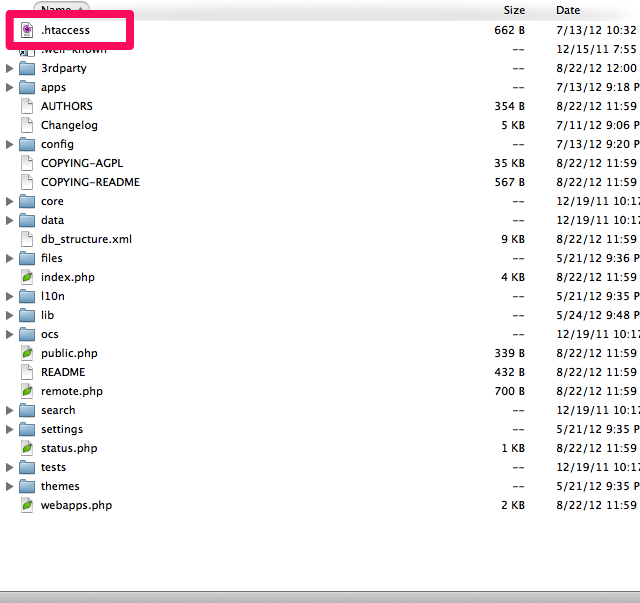 5) Once you have made all your adjustments, save the file and you should see the changes in the Owncloud installation. If you have a server dedicated to using Ownlcoud then it might be more worthwhile to just edit the php.ini file directly that controls these settings. This allows you to tweak a server wide setting instead of a site localized setting. *To do this you will be editing the php.ini file. To edit this file we will be using “sudo” commands. “sudo” must be used with care and caution. It allows you full control over all settings and files on the computer. We will make a backup of all files before we work with them to insure we can revert and keep our system running. 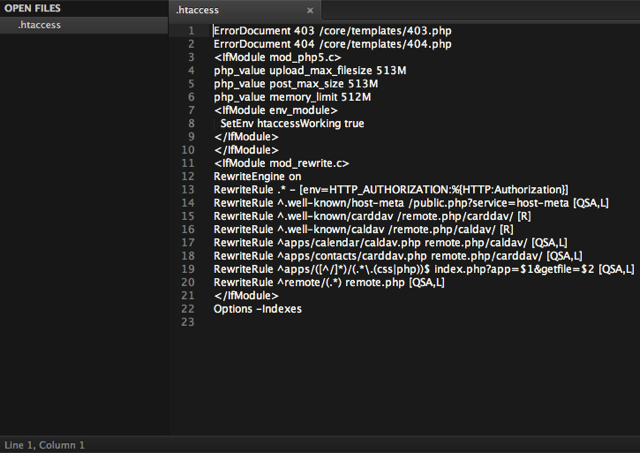 1) First lets backup the php.ini file on your mac. You will want to run the following command from terminal. 2) Type in your administrator password when prompted. 5) Type Control + W and search for upload_max_filesize. You will be taken directly to that part in the document. 6) Scroll over to the filesize and adjust to the level that you desire. 7) Complete this for each of the other 2 options following the same guidelines suggested in the first part. 8) Once you are done changing these settings we must save them. Type “control + x” to close the file, then hit “Y” and “enter” again. That will save the file. 10 The final step is to remove the following lines from your .htaccess file in your site root. Those settings will overwrite everything we just set. If you are running a Mac mini with an HDMI port, be sure to read our new post about the HDMI adapter for a headless Mac mini. The HDMI works much better for machines running Mavericks. Anyone know why Google Chrome would render very, very slow on a headless Mac mini? There were some good responses, and we decided it was probably the “headless” part of the equation and not the “Mac mini” part. I decided to connect a Mini-displayport -> VGA dummy dongle and sure enough, that took care of the issue. 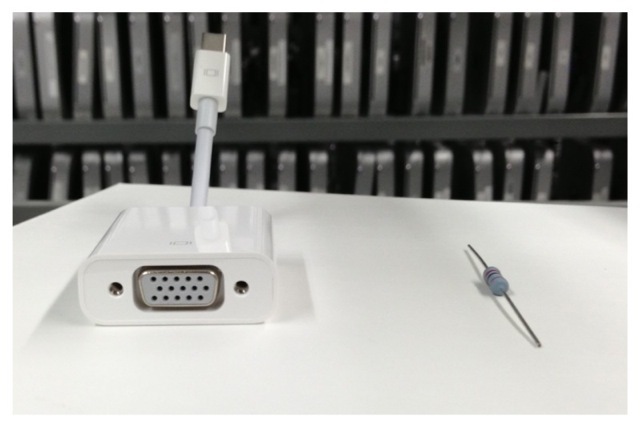 A dummy dongle mimics a monitor being attached to a Mac. It will force a Mac to load the video driver and take full advantage of the GPU. We’ve been connecting these for years for those customers who use video intensive servers, or those who run a linux build that won’t boot headless. And now it turns out that Chrome (as well as other browsers) can really benefit from the video driver being loaded as well. I reported back on Twitter that a dongle fixed the issue and had more than one request on how to build a dongle. I thought I had written this up years ago, but I could not find it. So here it is again. It’s easier than you think. 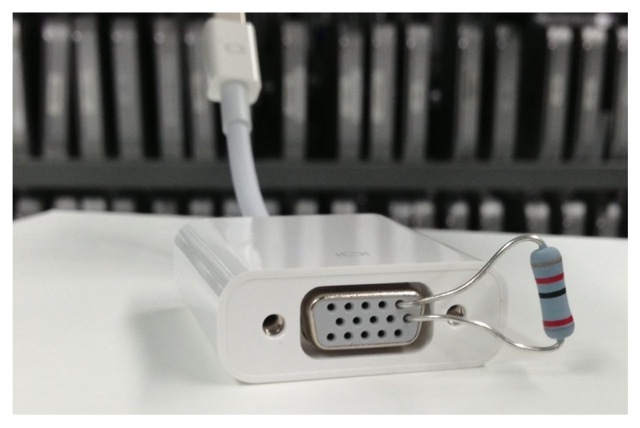 First, you need a mini-displayport -> VGA adapter. You can buy one from Apple or from Monoprice. You also need a resistor that can be bought from any sort of electronic store (Fry’s, Radio Shack, etc) I went with 85ohm. Then you’ll be connecting two pins on the VGA end. I went with the red out and the red return. That’s pins 1 and 6 for those scoring at home. That’s the extent of it. A couple things to keep in mind. I kept the wire long in this picture so it could easily be seen. Usually, I’ll trim it down just a bit, and then finish by bending it over and putting some tape on it. Also, when you plug it into your machine for the first time, it will bring the resolution down real low. But hopping into System Preferences and changing the resolution is a quick fix. Of course we have these available for any Macminicolo customers that would like them. (Just the cost of parts. No cost for the 9 seconds of labor.) There are only specific situations where these are really useful , but if need is right, they get the job done. For instance, if you do a lot of screen sharing with your remote Mac, this will offload much of that to the GPU and free up the CPU for getting things done. If you have any questions (or better yet, if you know how to do this with the dongle that comes with the Mac mini HDMI->DVI) send us a note @macminicolo. When Mountain Lion was released, it introduced Filevault 2. 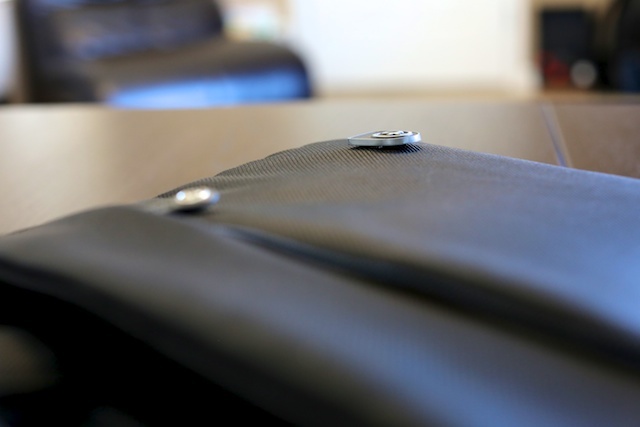 Filevault 2 "uses full disk, XTS-AES 128 encryption to help keep your data secure. With FileVault 2 you can encrypt the contents of your entire drive." It's a great way to keep your Mac data safe even if someone has access to the actual hardware of the Mac. When a Mac is using Filevault and restarts, it requires a password or recovery key before it will even start the bootup process into OS X. This is great because it's secure, but you run into an issue when restarting a remote Mac. The OS won't come back for you to control the remote Mac unless someone can physically put in the unlock password. But with OS X 10.8.2, you now have an option. Mountain Lion 10.8.2 introduced authrestart. If you open terminal and run "fdesetup help" then you will see all the options with filevault. 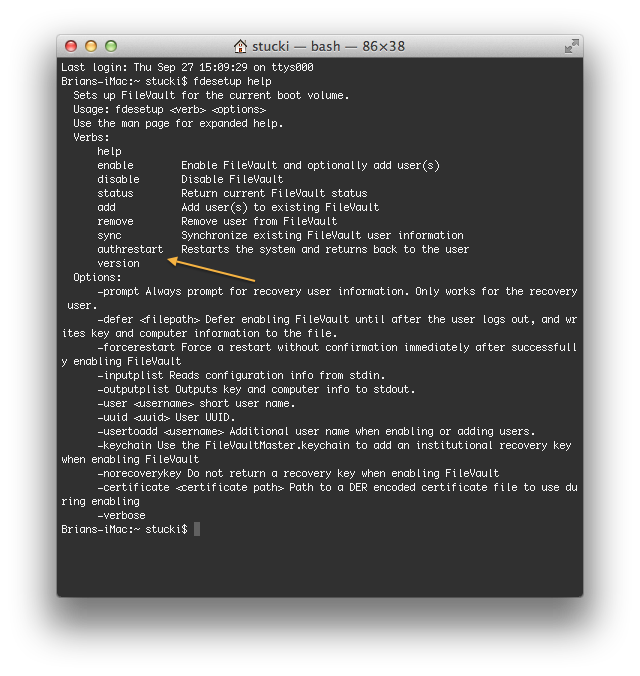 Now, when you need to restart a remote Mac that is running Filevault 2, you will open terminal and type "sudo fdesetup authrestart". After doing this, you'll be prompted for your password. Once entered, the machine will restart and bring you back to the OS login. It's a one time restart. It's a great tool. Macminicolo.net, a Las Vegas colocation company, has been hosting Mac minis since their introduction in January 2005. Low cost. High performance. They are the leaders in this niche market and are known for their personal service. They currently host hundreds of Mac minis for satisfied customers located in 31 different countries around the world. Get more info on our frequently asked questions page. Follow us on Twitter @macminicolo. 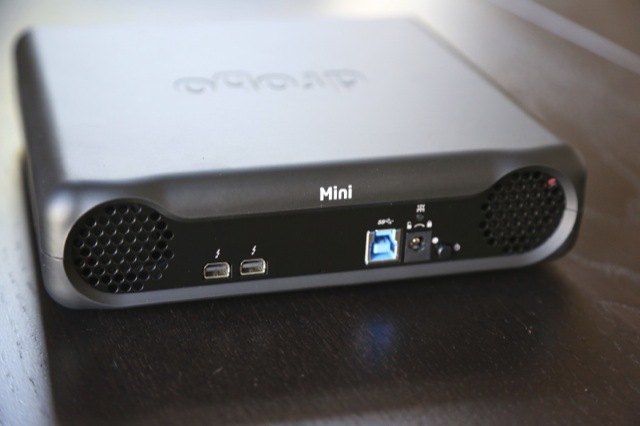 The other day, we took a look at installing Owncloud on a Mac mini. This is part two where we integrate Owncloud with Open Directory (OD). Again, we appreciate the help of @kolbyallen on these tutorials. Now you should be able to go the Users in the lower left and see all your OD users and then a listing of groups they can be added to. *NOTE: This will add all users in your OD, including the hidden ones. So be careful who you give Owncloud admin access to. 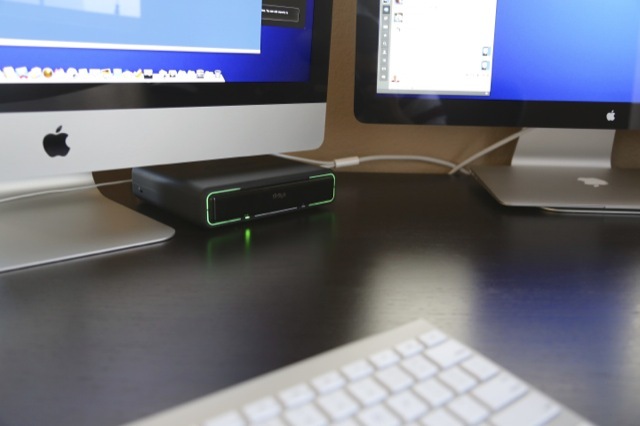 One benefit of hosting a Mac mini server is you can use it many different ways. Owncloud is a great service to add to the multi-purpose list. Owncloud is like running your own Dropbox service on your own machine. Don't get me wrong, I love Dropbox. But if you want your data on a server that you own, this is a good way to do it. Also, storage space is limited only by the space on the server. We've been seeing a lot of companies pondering whether they should put their data on a server they don't own or how to get plenty of data space for their full company. And for personal use, Owncloud will do the Dropbox-like data sync with revisions, but you can also do things like stream your music, share photo galleries, and all kinds of other features. There are apps for different OS versions as well (including mobile.) 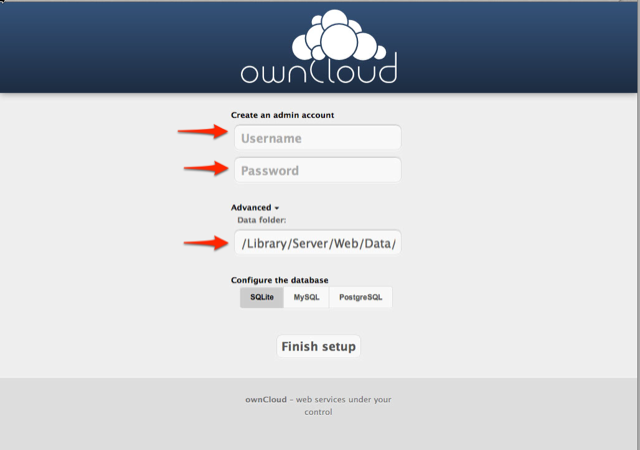 If you want to demo an install of Owncloud on a server, you can do that here. 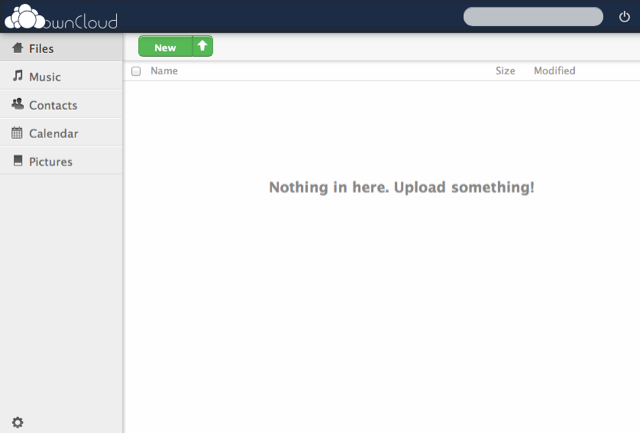 Ok, so Owncloud is awesome. How do you install it? Glad you asked. We worked with Macminicolo customer Kolby Allen, to put together a tutorial. He works as an IT consultant and web developer so if you need more help, reach him on twitter @kolbyallen. This tutorial series will provide differing levels of Owncloud installation. If all you want is a personal dropbox-like service then you only need to follow Part I. If you’d like to integrated Owncloud with OD’s LDAP then you will want to follow Part I and Part 2. If you’d like to add the ability to transfer larger amounts of data with Owncloud then Part 3 will help you tune PHP to handle the large files. Part 3 will also provide you a method to help trouble shoot any errors you might run into with Owncloud, especially memory limit issues. The first part is below. If you'd like to be notified when Part 2 and Part 3 are ready, you can follow this Tumblr blog (RSS Feed) or follow @macminicolo on twitter. And now, the tutorial. For this part of the install we will use the built in basic SQLite database that Owncloud defaults with. If you’d like you can create a mySQL database, but that is beyond the scope of this tutorial, though straightforward to execute. 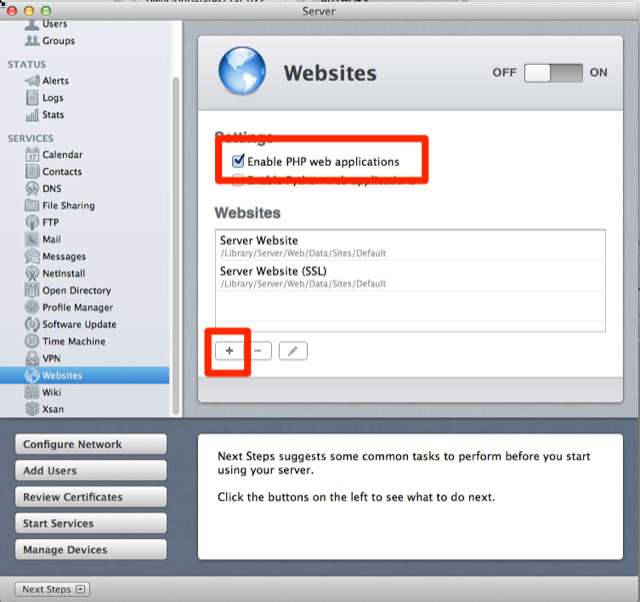 1) Activate web sharing in Mountain Lion Server and create a new site. In this tutorial, we will use ml.macminicolo.net as the domain. Check "Allow overrides using .htaccess files"
6) Visit your Owncloud website in a browser. Once you get there, you will be asked to enter a username and password. This will be the admin username and password. 7) Before clicking ok, be sure to click the "Advanced" link. Now remember we decided to store our data in a non web accessible location, so we will need to put the path to that folder in the Data Folder box. Click Finish and you are done with the install. 8) The final step is create users and groups. The default group created by Owncloud is the admin group. Adding people to this group will give them administrator access to the site to make changes. You can read more about this on Owncloud’s support website. Now you are free to upload files and run your own file syncing service. Owncloud also makes sync clients that let you run a desktop client that pushes data to your site or a mobile client to access the data. The desktop sync clients are here and iOS is here. Note: When we clicked the advanced tab you noticed that you had a choice of DB. For this tutorial I kept it simple and use SQLite. If you have mySQL installed you can select that DB and enter in your database information. That will allow you to store all the information in that type of DB. A while back, we wrote a post about setting up the VPN server in Lion Server. It has been a very popular page and a help to quite a few people. As usual, you can get us on twitter @macminicolo if you have any questions, or if you're looking for a good place to host a VPN server. 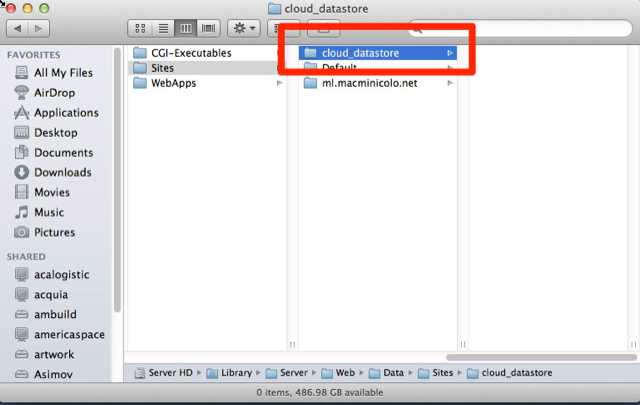 A while back we posted a First Look at Mountain Lion Server. Today, Apple released Mountain Lion to the public. It's a $19.99 upgrade in the Mac App Store (link). It's a great upgrade. First, please get a good backup. I recommend SuperDuper! because it will give you a bootable copy. (Time Machine is pretty thorough, but it's not bootable. Second, you can upgrade from Snow Leopard (10.6.8) or from Lion (10.7.4). Be sure your Mac is in the list of approved hardware. Third, if you are running a Server version of OS X already, then you'll need the updated OS X Server 2.0 in place in order to upgrade. That is also $19.99 (link) if you haven't purchased it already. Finally, when you start the upgrade, know that it will take 40-60 minutes. If the machine is sitting in front of you that's no problem. But, if you have a remote Mac mini server then that takes patience. Be sure to give it plenty of time before you start any remote reboots. If you have any questions, feel free to catch us @macminicolo on twitter. 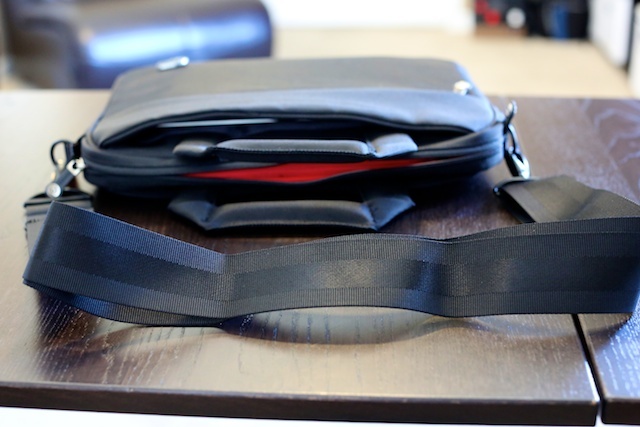 It's a good looking black bag and a nice "super soft plush interior." 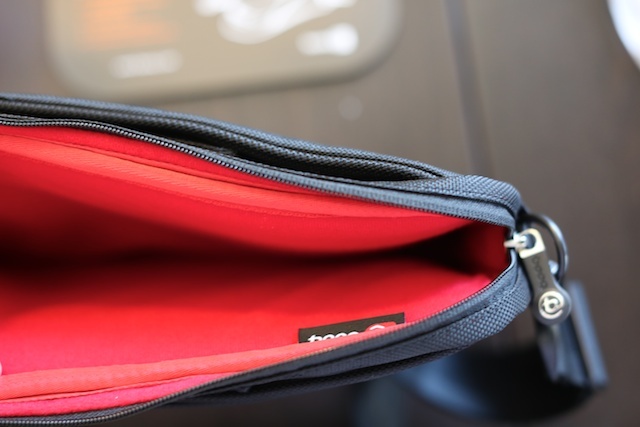 I like that all of the pockets are lined with this material, not just the one where the laptop is supposed to go. And of course it's great that the laptop is compatible with Macs. Phew. I won't have to deal with updating drivers or anything. 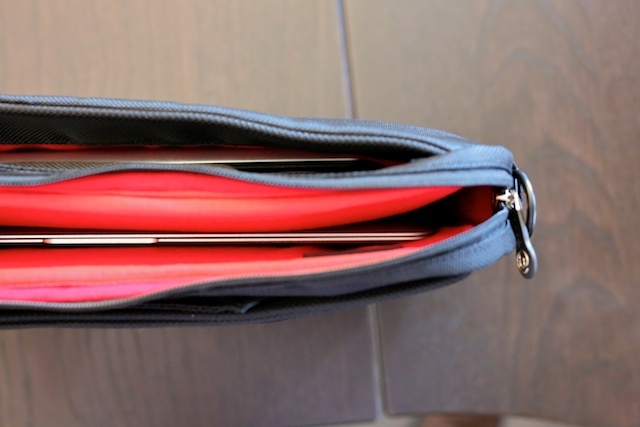 The bag is made for a 13in laptop, but because the pockets are so slim, it keeps an 11in MacBook Air pretty tight. (I'm glad I have the option for 13in in case I change in the future.) 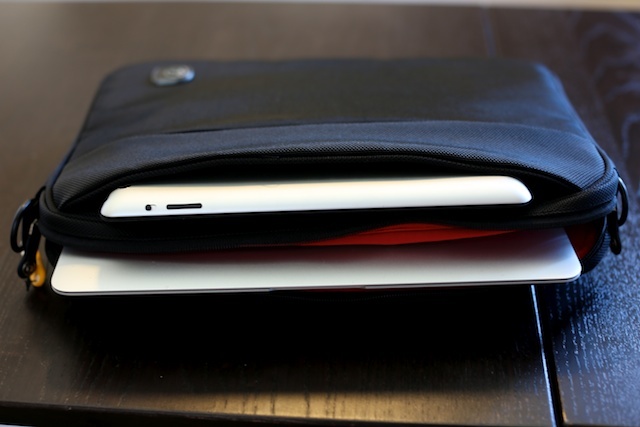 And when an iPad is concurrently in the second pocket, the two are quite snug. Overall, I like the new bag. 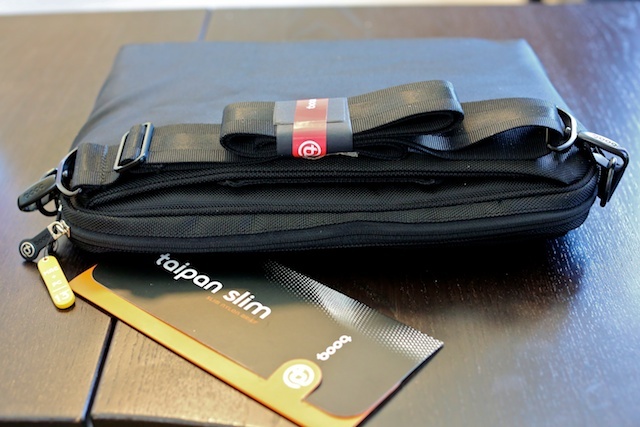 It matches my criteria of of being slim, but also two separate pockets for a laptop and iPad. The bag is $70 from their site, or $73 if you want to grab it from Amazon because you like the Prime Shipping and easy checkout like me. A couple weeks ago, Apple introduced iPhoto for the iPad and iPhone. It's a great application that makes it real fun to work with photos on the new iPad. One of the limitations mentioned is that it can handle up to 19 megapixel photos. This spec covers most consumers and even prosumer cameras. But I wondered how it would handle the 22MP photos from the new Canon 5D Mark iii. Now that I finally have all three components in the same place, I thought I'd share my findings. I then used the iPad camera connection kit to import this photo to the new iPad. First, if you connect your iPad to your Mac and import into iPhoto, the photo will come over in full 22 mexapixel resolution. 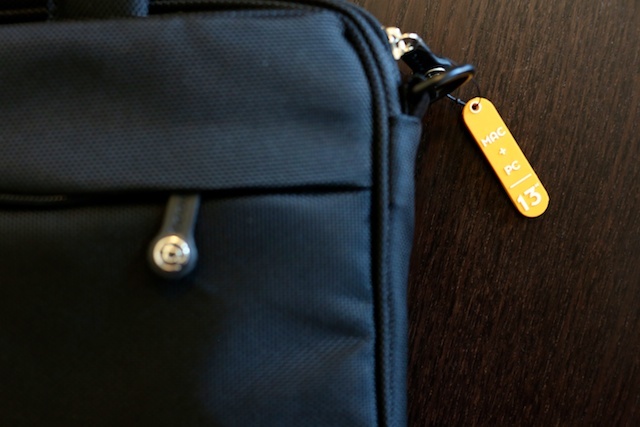 Of course, this is a great way to backup all your photos while on a trip or photo shoot. If you absolutely had to, you could sync to your iPad and erase your memory card for more photos. When you get home, you'll be able to bring everything over from your iPad. Second, I tried the option to share the photo from the "Photos" app. When you do that, the photo is sent in it's full 22MP resolution. I tried it on both wifi and LTE and it was sent the same either way. The photo still looks fine of course, but it does cut the resolution quite a bit. At this point, you can work with your photo and do the edits you'd like to do. When you are done, it's time to share. Here is where it gets interesting. If you use the built in "Share" menu, you have a few options. If you decide to email it, the photo is scaled all the way down to 2880x1920 (from the original 5760x3850). The size drops down to 319KB from 3.5MB. No doubt this is to make for a smaller attachment. The photo still looks decent, but you are losing quite a bit of the photo data. If you want all the resolution and file size differences, you can download the zip folder here or just see a screenshot of the "Get Info" differences here. Overall, Apple probably made the right call with all of these options. In any scenario, the image looks good and is prepared well for the intended use. I'm just glad to finally know how it works...I hope you are too. Apple introduced their next operating system, OS X Mountain Lion. For the most part, it's a better unification of Lion and iOS. But, for the overall look, I refer you to other great posts like this one. Since we host Mac mini servers, I wanted to take a look at what Mountain Lion means as a server. They released the Server preview today as well, but it is very much a preview. For instance, it doesn't provide the ability to upgrade from Snow Leopard Server. Also, you can't backup and restore using Time Machine with this seed. I'm sure both of these options will come later. You still upgrade a a regular version of Mountain Lion with the Server app from the Mac App Store. In other words, you upgrade "OS X" to "OS X Server" by installing the app just like Lion. And from a first look, it seems you'll have to do that for one of the most basic things. For the first time that I can remember, the "Sharing" pane in OS X System Preferences no longer has "Web Sharing." You used to enable Web Sharing to make your Mac run a website with apache. The option is no longer there in OS X. Though Apache is still installed and you can start it at the terminal. My guess is that the "Web Sharing" was confusing for the majority of users. When Lion introduced Server.app, there was still Server Admin that you could download from the Apple website and use for some of the advanced services. I can't say this with 100% certainty, but it looks like Server Admin won't be there for Mountain Lion. I guess we'll see on that front. The Mail service continues to be so, so simple. Just enable the service and adjust the filtering. This is great because a Mac mini mail server has been a popular request now that Google has been changing it's privacy terms. We're seeing a lot of transitions by business from Google mail to mail servers of their own. I like the new Alerts options. In addition to getting Push Notifications for email, "OS X Server can send push notifications to alert you about new Software Updates, unresponsive volumes, hard drives getting full, and users that have exceeded their mail quota." Along with Mountain Lion comes Messages, a replacement for iChat. You can download Messages now. When I installed the Messages app, I noticed right away that it would no longer accept text invitations automatically. In other words, when I get a chat I first have to accept it and then I can respond. Luckily, when iChat was replaced, it didn't wipe out the Scripts folder. So, you can still use the iChat script in Messages. When you do this, it will also create a new folder and move that script to a new location at ~/Library/Scripts/Messages/. Glad to have that back. I was going through a folder of old images and found this one. When we were first starting out 7 years ago, I had built a wall of the Mac mini boxes and took this picture. My wife thought it was fun at first, but as we filled the whole room, she thought it was "less cute." You can click on the image to enlarge it. Can anyone name all the boxes? (I imagine that the small black one near the Airport Express may be the hardest to remember.) Take your guess @macminicolo on Twitter. We have customers in 47 countries. In other words, one out of every four countries has a Macminicolo customer. Now that's just neat to think about sometimes. And it's not just a high quantity of customers, but also high quality customers. Some customers have been here since day one and we really work hard to keep them. But the most important number is this, 1429%. That is the increase in benchmarks from the first Mac mini to the current generation Mac mini. Maybe a graph will help? The image below marks the benchmarks of each Mac mini release, with the mid-2011 showing both the dual-core and the quad-core options. Benchmarks come from Geekbench at Primate Labs, a great developer we are proud to call a customer. So here is to seven great years of Macminicolo and the Mac minis themselves. 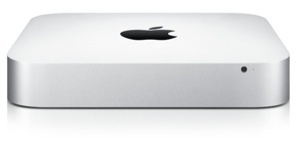 If you'd like to host a Mac mini, you can see the pricing here or ask some more questions at our contact page.